Fruit and booze combos are always a treat. 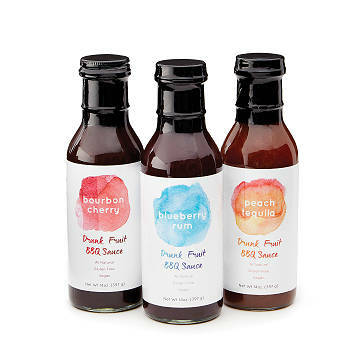 Add smoke, and you get these three mouthwatering BBQ sauces. Three ripe fruits were at the bar, blissfully sipping next to a crackling fire. One of them said, "We should make this awesomeness permanent." So they turned into sauces and bottled themselves (in very small batches, of course). Each flavor is a luscious, fruit-forward combo of sweet, savory, and smoky, with a hint of tasty hooch: Blueberry Rum, Peach Tequila, and Bourbon Cherry. Insanely delicious as a glaze, cooking, or dipping sauce. Made in Ohio.